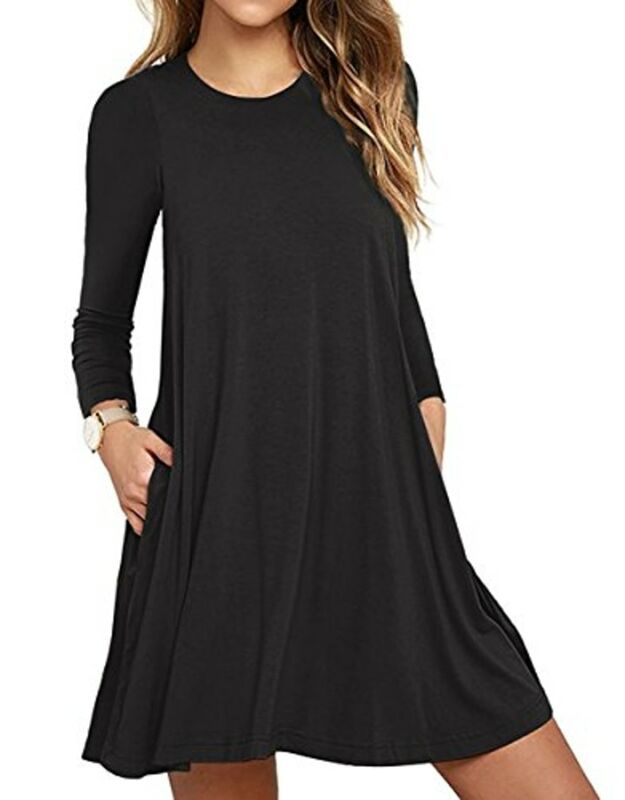 Looking for a comfortable, long-sleeved T-shirt dress with pockets? Look no further. In fashion, three words can change everything: "It has pockets." I normally wear dresses only to weddings. I’m also a brand loyalist. Still, those three words were enough to convince me to give one of Amazon’s best-selling dresses a try. It has earned more than 2,300 reviews and a 4.2-star rating. 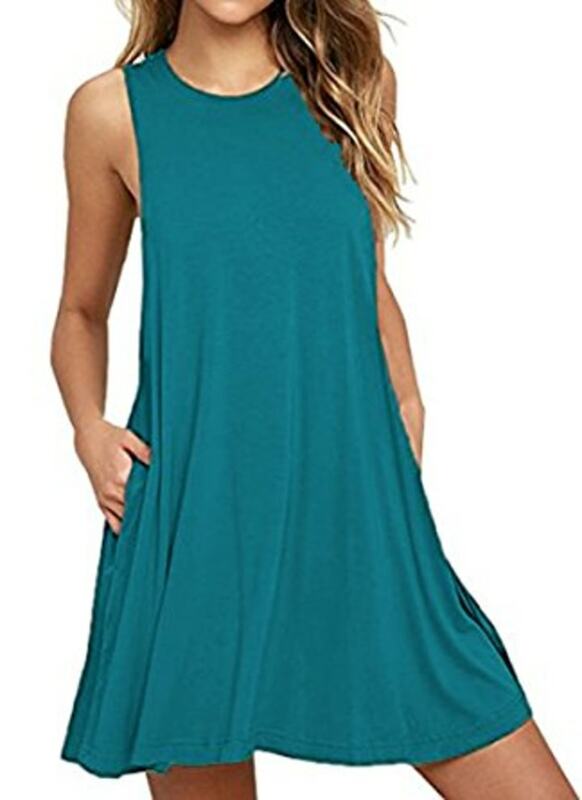 It costs between $14 and $19, depending on which of the 20 different colors and styles you choose (plus it's eligible for Prime free shipping). Playing it safe, I got gray. If I were bolder, I would have ordered the purple-gray swatch. When the mail carrier showed up, I didn’t sprint down the stairs like usual. I was nervous. The fact that it's from a brand I'd never tried before had me worried about the fit. Advertised as having a “comfy swing silhouette” that “flares to a perfect finish,” it sounded too good to be true. One of the reasons I’m so brand loyal is because I like to know how something will fit. 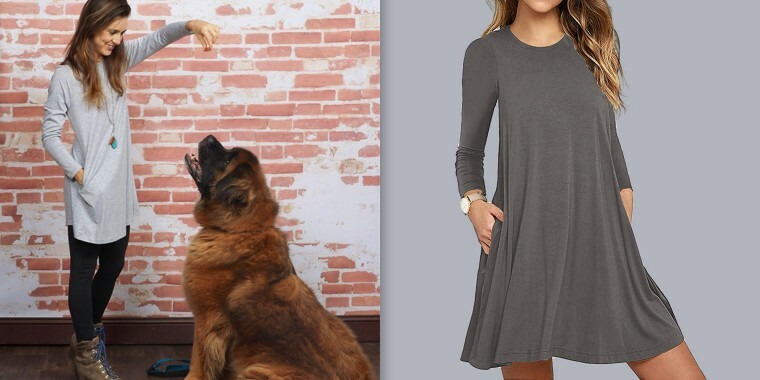 Still, it was semi-reassuring that 78 percent of Amazon reviewers found this dress to fit as expected. First, I noticed the color was spot on. I’m not sure how you can mess up plain gray, but you never know. Second, the jersey knit fabric felt like my favorite T-shirts. So I approved of the color and material, but the fit was slightly less flattering than promised. Unless you keep your perfectly angled legs open and your hands halfway in the pockets like the model, you probably won't achieve the perfect flaring. That said, the silhouette was flattering enough that I didn’t need to wear a belt or add a vest. In fact, the first time I wore it out, I simply paired it with leggings, Sorel boots and a necklace. Within minutes of posting a picture on Instagram, I received a "Cool top!" compliment. If you're looking for a similar option to wear all summer long, it comes in a sleeveless version for hotter days. The description says to hand-wash and hang dry, but I tossed the dress into my washing machine and dryer with a load of branded non-dresses. It came out clean, and I didn’t notice any change in fabric or fit. Though I don’t love the dress enough to order one in every color, it is hanging in my closet closest to the door. It's pretty much a staple. Note: I’m 5 feet, 4 inches tall and 110 pounds, and I ordered a size small. 18 must-have rainy-day items to keep the whole family dry ... and stylish!